Tripp Lite's M100-003-WH 0.91 m (3-ft.) White USB Sync / Charge Cable with Lightning connector allows for Uploading / Downloading data to and from the latest generation of iPhone, iPad, and iPod devices, while charging the devices at the same time. Cables are MFI Certified, so they are made for use with iPhone 5, 5c, 5s, 6, 6 Plus, iPad (4th generation), iPad mini, mini 2, mini 3, iPad Air, Air 2, iPod Touch (5th generation), and iPod nano (7th generation). Reversible Lightning connector allows plug-ability in either direction to the device. The MFi Certified M100-003-WH 3 ft. Cable with Lightning Connector lets you connect your iPhone, iPad, or iPod to sync your device with your media library and charge it. Portable and convenient, you can easily take this cable anywhere. The M100-003-WH’s superior construction means it will stand up to constant use. Plus, it comes with a 2-year warranty for peace of mind. Don’t want the dreaded “this accessory may not be compatible” message to appear when you use your cable with lightning connector? Then don’t accept cheap knock-offs! The Tripp Lite M100-003-WH with lightning connector is MFi Certified to be fully compatible with many Apple devices. 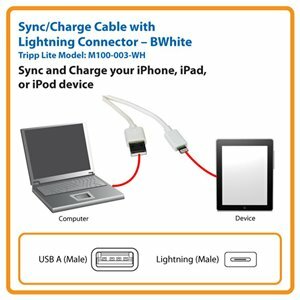 The latest generation iPhone, iPad mini, iPad, iPod touch, and iPod nano all work with this versatile cable (for complete compatibility details, see the bullets at the top of this page). To guarantee your cable is authentic, make sure it’s sold by and shipped from Amazon, and it arrives in its original Tripp Lite packaging. And if you don’t see this packaging, it’s not a genuine Tripp Lite cable! The M100-003-WH is manufactured to exacting specifications, using superior materials, for reliable service for years to come. The Lightning connector is reversible, making it easy to plug into your device. The 3 feet/0.9 meter length lets you easily connect to a USB port on most computers. Light-weight with a low-profile, the M100-003-WH fits easily into small pockets and bags. Take this cable wherever you go! The M100-003-WH is manufactured in compliance with strict RoHS specifications, reflecting Tripp Lite’s commitment to environmental responsibility. For peace of mind, it comes backed by a 2-year warranty.